Nowadays, the fills of pillow become more various. Not just only a solid material can be a fillers for pillows. Pillows can now be fills with air or liquid. 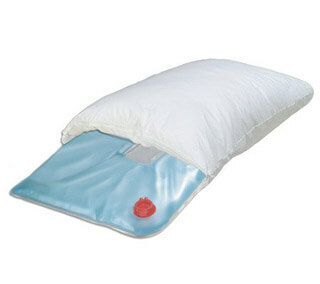 Water filled pillow is uniquely designed in various motives and colors. By using high quality plastic or rubber materials, so the water inside the cushion does not leak, evaporate, and water temperature can be more assured. The use of water-filled cushion is mostly done in the health field. Because the pillow with the water material, the temperature is relatively lower than the human body. The use of water-filled cushions is usually to lower body temperature or to transform the cool temperature of the pillow to the body. In addition to seeking coolness from water. The use of these pillows is more often uses to people who have spinal problems, back pain, diabetes and trauma injuries (ulcers). However, normal or healthy people can use this water pillow to get the sensation of coolness from the water. Water-filled Pillows construction are structurally similar to air cushions. Made of plastic / rubber base material. Water-filled cushions when not in use can be fold and store with minimal storage space. If you want to use, just fill it with water. As technology advances. Pillows are made with combination materials, water / gel / liquid with other materials, such as foam or latex. In the structure, usually the gel is located in the bottom layer or inside the pillow core. Now even there is a hot water cushion (electric heating) that usually its use as a tool of health therapy. The cushion which contains water, can be heating when it is connects to an electricity. Smooth blood circulation in the treated part of the body. Reduce the pain / stiff at waist, stomach, back etc. Now just choose which one do you need? Ordinary Water-filled Pillows or Electric Heating Pillows? If you are healthy, you just use a conventional pillow ordinary of course.